As many marketers are all too aware, things in the field of B2B marketing don’t stay the same for long. There’s always a new idea, approach, software, or company to pay attention to, all touting the best tactics to implement for your marketing strategy — but to understand where your marketing strategy is going, you have to know where it’s been. So take a little walk down memory lane with us and see how we got from there to here. We’ll take you back to a dark time: a time without the internet. It may seem like a long time ago, but it was in the recent past that marketers relied solely on what we now call “traditional marketing methods”. They believed in the power of things like print ads, direct mail and billboards. T.V. and radio ads were just about the best you could get. And it was all without any real or measurable data to indicate how their efforts were performing. That being said, plenty of marketers still use these methods today, and there’s nothing wrong with that – especially if they’re used in conjunction with more modern approaches. Moving into B2B marketing’s more recent past, we come to a much more familiar time. It’s the 90s, and the introduction of the internet was making marketers’ heads spin with possibility. Email marketing started to catch on, then Google jumped on the bandwagon with an advertising platform today known as Google Ads. We began to see ads in our search results, and on most websites on the internet, along with social media and its’ advertising platforms. This time period may sound much more familiar to most marketers, but there’s still a long ways to go before we get to the cutting edge of marketing. Throughout the evolution of B2B marketing, the funnel reigned supreme. 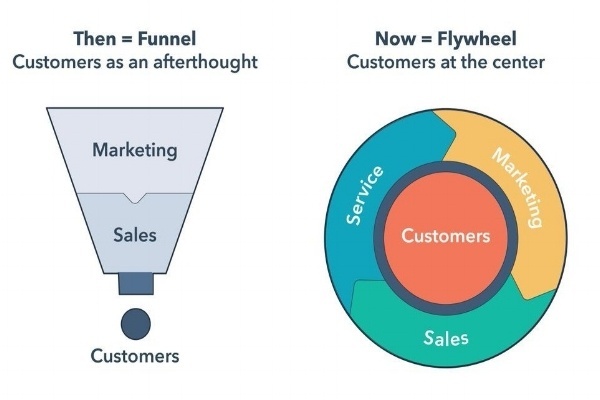 With marketing and sales at the top and customers at the bottom, the early version of they funnel strived toward the ultimate goal of shoving as many people as possible down the funnel to become customers – regardless of their fit or even their need for the product or service. This approach ultimately caused more unhappy customers, led to a high cost per acquisition, and produced low lifetime value of the customer. Don't get us wrong – that's not to say that the funnel (when used correctly) isn't a helpful and effective methodology. Now to the present. The introduction of the flywheel changed the way many marketers (including us) think about what B2B marketing success means. How do we harness the power of word-of-mouth marketing? How do we ensure that we work with high-fit customers? How do we retain those customers? The answer to all of those questions is encompassed in the concept of the flywheel. The flywheel places customers at the center of a business while marketing, sales and services revolve around them, not the other way around. The flywheel has challenged marketers to shift the way they think about success, and about what matters most to their business. It has also empowered customers to choose the companies that will provide the most value. At the end of the day, any and all marketing methods that bring in and delight your customers are good methods to use. The shift to the flywheel only challenges businesses to think about how their success is tied to their customers, and create a strategy that prioritizes customer success as a vehicle for the success of their business as a whole.